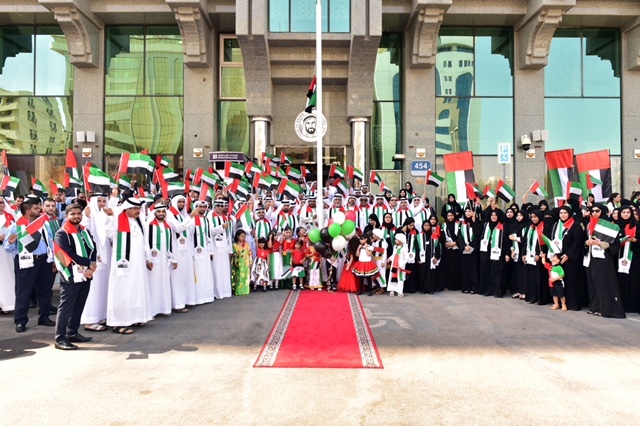 In response to the call by HH Sheikh Mohammed bin Rashid Al Maktoum, Vice President and Prime Minister of the UAE and Ruler of Dubai, for a simultaneous UAE flag raising at all government and private entities on November 3 every year, the Awqaf hoisted the UAE flag high on top of all its premises at all of its branches across the UAE. The Flag Day coincides with the anniversary of HH Sheikh Khalifa bin Zayed Al Nahyan, may Allah protect him, becoming the President of the UAE. Marking this glorious national occasion, HE Dr Mohammed Matar al Kaabi, Awqaf’s Chairman, extended his sincerest congratulations to HH Sheikh Khalifa Bin Zayed Al Nahyan, the UAE President, HH Sheikh Mohammed Bin Rashid Al Maktoum, Vice President and Prime Minister of the UAE and Ruler of Dubai, HH Sheikh Mohammed Bin Zayed Al Nahyan, the Crown Prince of Abu Dhabi and Deputy Supreme Commander of the UAE Armed Forces, Their Highnesses the Members of the Supreme Council, Rulers of the Emirates, and to the Emirati people, imploring to Allah the Almighty to continue blessing the UAE, under its wise leadership, with security, stability and prosperity and to grant it success to continue mounting on the ladder of glory and civilisation. Dr al Kaabi further affirmed that marking the UAE Flag Day bears the connotation of harmony in the Emirati society and the allegiance of its members to its astute leadership that placed our beloved country at the forefront of the advanced countries of the world, and our people amongst the world’s happiest people. This is thanks to the decent life and prosperous livelihood it provided for Emiratis, Dr al Kaabi added, pointing out that this occasion is a call for us to continue hard work, resilience and innovation so as to sustain the march of giving and excellence of the UAE. Al Neyadi explained that, in peoples’ lives, the flag is a symbol of pride, unity, affiliation and identity. “The nation’s martyrs who sacrificed their souls in the way of protecting the religion, rights and honours are but a great evidence on the love and belonging that our people bear for this homeland and loyalty to its leaders,” added al Neyadi.